When I was a kid, my grandma would often sternly say, “Eat every single grain of rice in your bowl. Don’t leave any of them.” I would look into my rice bowl and see two or three grains stuck to the sides. It was difficult to pick up a grain of rice with chopsticks when I was little. I also didn’t care. I just wanted to finish my meal and watch TV. “One grain of rice has 88 souls inside. If you leave even one, you’ll lose your vision.” Then she started writing the character for “rice” in the air with her finger. Can you see the hidden message? I thought that was an interesting story but was old enough to know she was bluffing. I simply replied, “Okay” and quickly cleaned my rice bowl so I could start watching TV. She also didn’t explain about what the “soul” was and I didn’t bother to ask. After that I still didn’t care about finishing to the last grain of rice. I hadn’t lost my vision but by the time I was 10, my sight became poor and I had to have glasses. After that I changed my habit but it was too late. My brother explained what I hadn’t understood before. There are 88 processes for farmers to produce rice. 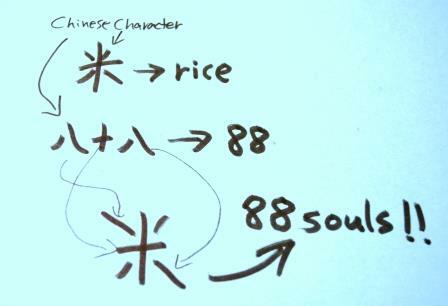 That’s why the character for rice can be read as 88. We shouldn’t waste even one grain because it is so complex to produce. The farmers also deserve our thanks for their hard work by us eating every last grain served. That is really interesting. Isn’t it funny the stories we have to get children to eat their food. We were told to eat carrots so we could see in the dark. Actually there is a bit of truth in that one as I later found out that carrots contain Vitamin A which is necessary for seeing in low light conditions. The myth that they can help you see in the dark began in World War 2. Thanks for the link. It’s really interesting that there was a similar kind of story. Even though the distance there are some similar stories in this world. I love to know that kind of stories! 88 processes, 88 souls…I think there are more stories about rice in Japan but the common thing is always to teach usually kids about the importance of rice or farmers. Interesting story. A nice bit of superstition to teach kids about agriculture and make sure they work on their chopstick skills. Thank you for your comennt. I think Japanese (or Asian) ways of discipline kids are bit different from western ways. This is the second reblog in a series showcasing my hubby’s posts from his site Gozumezu – Sharing Japanese Mysteries. Every time I eat a bowl of rice, I remember when Hitoshi and I first met. He told me to finish every last grain in my bowl or I’d lose my sight. Now when I tease Hitoshi about leaving grains in his own bowl, he tells me his eyesight is already bad. This post tells two versions of the story about why we should not leave even one lonely rice grain sticking to the side of a rice bowl. What about you? Did you grow up with special stories about food, how to eat, manners or the like? Very nice and funny story. Thanks for sharing. Interesting to see that every culture although diverse, use the same tricks to make kids eat their full meals. Thank you for your comment. Yes, that was a trick and now I know it off course but even after over 30 years, when I see one grain of rice in my rice bowl, I am afraid of losing my vision! !